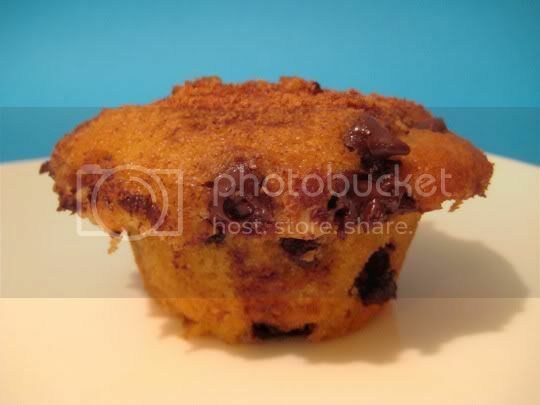 These muffins are like eating huge chocolate chip cookies! Moist, soft, rich, and just wonderfully delicious. The recipe called for semi-sweet chocolate (which I used), but personally, I like milk chocolate for baked goods such as these. Still, the bitterness of the semi-sweet chocolate was just the right complement to the sweet buttery muffin and the crunchy, sugary, cinnamony topping. I think the topping was a bit much, maybe even unnecessary, but it was interesting to combine cinnamon with chocolate chip "cookies"...something to possibly try for the future. Easy to make, and even easier to eat! Pair with a nice cold glass of milk, and you've got yourself a delicious breakfast or dessert! Make again? Yes. Although I typically think of muffins for breakfast, this would be a unique twist for dessert. Mini-muffin size!